Before getting your nose pierced, you should consider the possible risks of the procedure. As with all body piercings, there is a risk of contracting a blood borne disease--such as hepatitis--from piercing guns or needles. Make sure you see a reputable piercer who can help give you advice about the risks of piercing, how to clean your piercing and the safest jewelry to wear. Septal hematoma is bruising or bleeding in the septum, the cartilage and flesh that separates your two nostrils. Any injury to the soft tissue--including piercings or a broken nose--can cause a buildup of blood and fluid. Septal hematoma can cause nasal congestion and trouble breathing through the nose. It will also increase your risk of developing a painful infection. Untreated septal hematomas can lead to a hole forming in the septum, causing nasal congestion or even making part of your nose collapse. 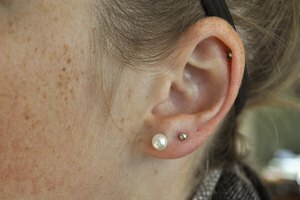 Piercings through cartilage are more susceptible to infection than piercings through flesh, such as the earlobes. In addition, staphylococcal organisms are present in the nose and can lead to infections, and you can develop a septal hematoma, which becomes infected. You can help reduce your risk of infection by gently washing the area around the piercing with antibacterial soap twice a day until the piercing heals. For nose piercings, the healing time is generally two to four months. The jewelry you use in a nasal piercing--as well as the piercing itself--can be risky. For example, part of a nose ring can come loose, which you can then aspirate or accidentally swallow when it travels up your nasal passages. Nose rings can get caught and tangled, leading to painful, torn nasal cartilage. Using the wrong type of metal in a piercing can cause an allergic reaction. The safest metals for new piercings are stainless steel, 18-karat gold and titanium. How Can I Tell if My Eyebrow Piercing Is Infected? 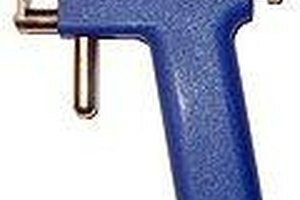 How Does an Ear Piercing Gun Work?